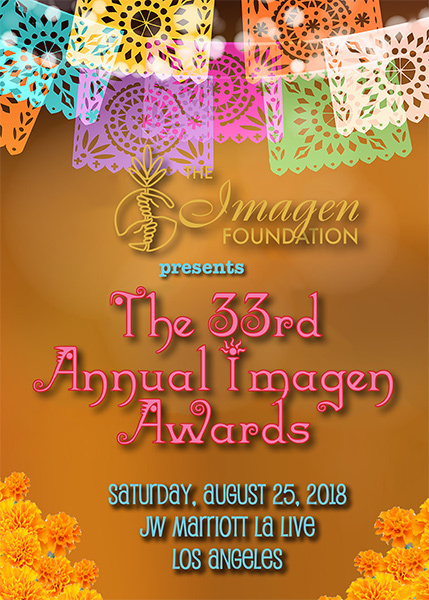 Join the Imagen Foundation for what is sure to be a phenomenal and star-studded event as we celebrate the 33rd Annual Imagen Awards on Saturday, August 25 at a new venue – the J.W. Marriot L.A. Live in Downtown Los Angeles, California. Price: $350 per person (includes dinner and the awards ceremony). Ticket and table purchases are non-refundable. Fill out the form below to purchase ticket(s) or table(s). Click here to download the invitation. For questions, contact the Imagen Foundation at (626) 376-9751 or email awards@imagen.org. Please fill out the form below to purchase your ticket(s) or table(s). You will receive email confirmation once purchase is completed. Online ticket purchases are no longer available. Tickets can be purchased (cash and credit card only) at the door starting at 5pm. Please note that seating arrangements have been finalized and that all last minute purchases will be seated on a space available basis.